The main idea behind this feature is certainly interesting. 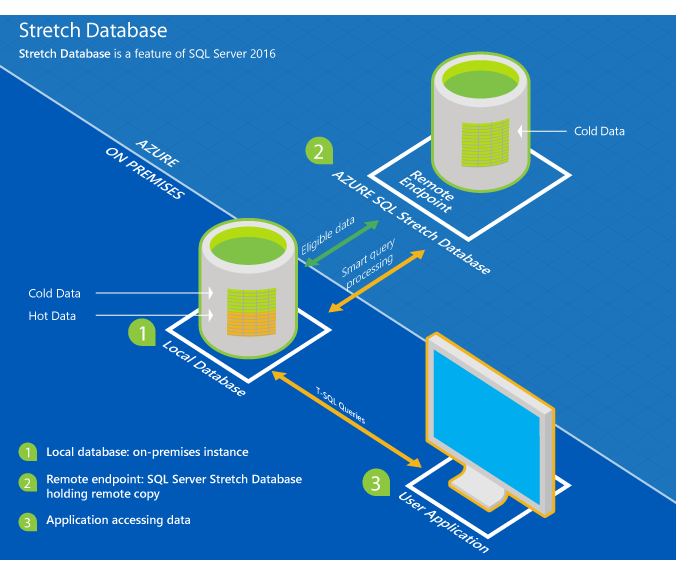 The upcoming stretch database feature will allow you to dynamically stretch your on-premise database to Azure. This would enable your frequently accessed or hot data to stay on-premise and your infrequently accessed cold data to be moved to the cloud. This could enable you to take advantage of low cost Azure store and still have high performance applications. However, this is one trick where Microsoft really needs to get the partitioning right to keep your queries from straying into the cloud and killing your performance. Stretch warm and cold transactional data dynamically from SQL Server to Microsoft Azure with SQL Server Stretch Database. Unlike typical cold data storage, your data is always online and available to query. You can provide longer data retention timelines without breaking the bank for large tables like Customer Order History. Benefit from the low cost of Azure rather than scaling expensive, on-premises storage. You choose the pricing tier and configure settings in the Azure Portal to maintain control over price and costs. Scale up or down as needed. Visit SQL Server Stretch Database Pricing for details. Access your SQL Server data seamlessly regardless of whether it’s on-premises or stretched to the cloud. You set the policy that determines where data is stored, and SQL Server handles the data movement in the background. The entire table is always online and queryable. And, Stretch Database doesn’t require any changes to existing queries or applications – the location of the data is completely transparent to the application. Reduce on-premises maintenance and storage for your data. Backups for your on-premises data run faster and finish within the maintenance window. Backups for the cloud portion of your data run automatically. Your on-premises storage needs are greatly reduced. Azure storage can be 80% less expensive than adding to on-premises SSD. Enjoy peace of mind as you stretch your most important applications securely to the cloud. SQL Server’s Always Encrypted provides encryption for your data in motion. Row Level Security (RLS) and other advanced SQL Server security features also work with Stretch Database to protect your data. Follow Blog at www.sqltop.com/blog/ and try SQLTop (www.sqltop.com) to review SQL Server & Oracle Database Performance. Big Data : What is Fluentd?